Medical staff from our partner CARPA have been examining patients in the Municipal Nursing Home in Bel Air, Port-au-Prince. CARPA doctors also visited the UN hospital to collect free medical supplies which will be given out today. Margaret Chilcott said, “We will hire someone to do some cooking and get water points set up. We can see that more caregivers are urgently needed.I saw one man not eating despite his hunger, apparently because he couldn’t eat without help. We are now responding and trying to get more medical supplies to the older people in the home. We are able to get hold of supplies, but the problem is that delivery and distribution mechanisms are extremely weak.There are also large numbers of destitute people all around the home which makes it difficult to deliver specifically to the care home residents. 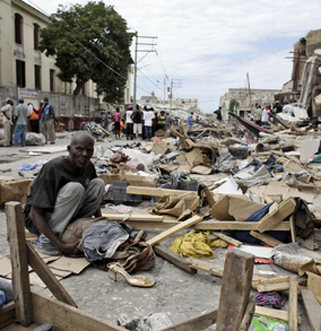 About 800,000 Haitians are over 60, and many of them live in extreme poverty even under normal circumstances. Old people tend to suffer disproportionately during disasters, and are less capable of fending for themselves in the aftermath. I suspect they also tend to be disproportionately overlooked by even the most well-meaning relief efforts. HelpAge is a rare exception. Last week they entered into a partnership with the AARP Foundation to gain more support for their work. 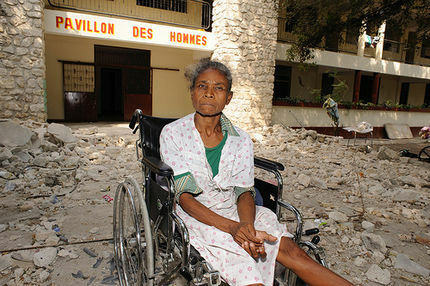 “HelpAge has on-the-ground experience in Haiti and is the only international relief agency that focuses on the unique needs of older people in an emergency,” said AARP CEO Barry Rand. You can donate to HelpAge’s work in Haiti via their Haiti Emergency Fund at HelpAge USA or through AARP Foundation’s Haiti Relief Fund. This entry was posted in age discrimination, health care, international, poverty and tagged AARP Foundation, earthquake, elders, emergency relief, Haiti, HelpAge, nursing homes. Bookmark the permalink.